And with the blessings of Easter, comes a day filled with yummy food – am I right?! 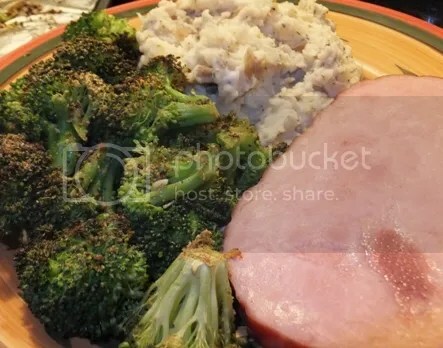 😀 Nothing says Easter like a simple ham dinner, and so we had just that!! With smashed potatoes made, with Philly Garlic and Herb cooking cream, and a bit of milk. I do need to make smashed potatoes with Boursin cheese, as I’ve heard rave reviews about it. Next time!! We also had a nummy side of seasoned roasted broccoli, which roasts in 15mins at 450 degrees. Of course, no Easter dinner is complete without dessert!! 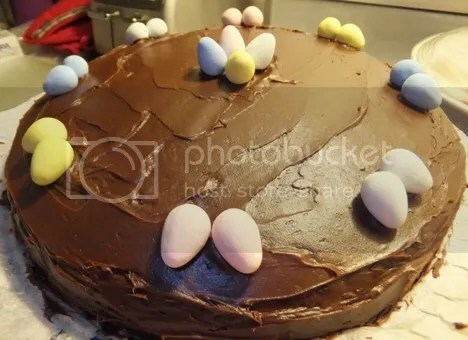 And I decided to make a Chocolate Fudge cake with chocolate frosting, decorated with Cadbury Mini Eggs 🙂 Now, I know it’s easy to make a cake from scratch, but I did have this Betty Crocker cake mix that was screaming to be made. And I always buy the frosting for the sheer convenience, and ease of use. Put these ingredients all together and voila! !